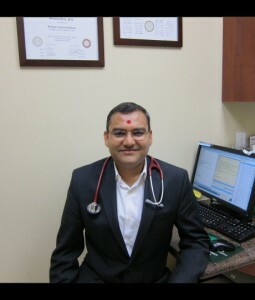 Bhagwat Patel, MD, PA offers a comprehensive approach to Internal Medicine. His friendly staff are dedicated to providing you with prompt individualized attention and the best care available all in a comfortable and compassionate environment. We recognize that attending to your needs are essential for making your visit with us a positive experience. Our friendly staff is trained to serve your entire family. We want you to know that the standard of care we provide you, is the same standard we would apply to our own families.Since 2004, Dr. Patel has been practicing in Sugar Land with a goal to provide the highest quality of care possible. He has had training focused on preventing, diagnosing, and treating diseases that affect adults and he regularly puts that training to use in each of his patients.Our facility is located just a block away from St. Luke’s Hospital, allowing easy access to medical imaging technology and medical specialists. Dr. B. Patel’s philosophy is to treat patients the same way he would treat his family. He resides in Sugar Land with his wife and two children. Dr. B. Patel understands that your time is precious. We will help you get back to your regular routine as quickly as possible. For your convenience, Dr. B. Patel provides a variety of medical and preventative serives in the same building. We can handle everything from school physicals, Well-Woman Exams, chest pain, EKG testing, and smoking cessation to immunizations and general medical care–offering you complete and comprehensive care at one location.